It's my turn to post over at Twine It Up! with Trendy Twine today. 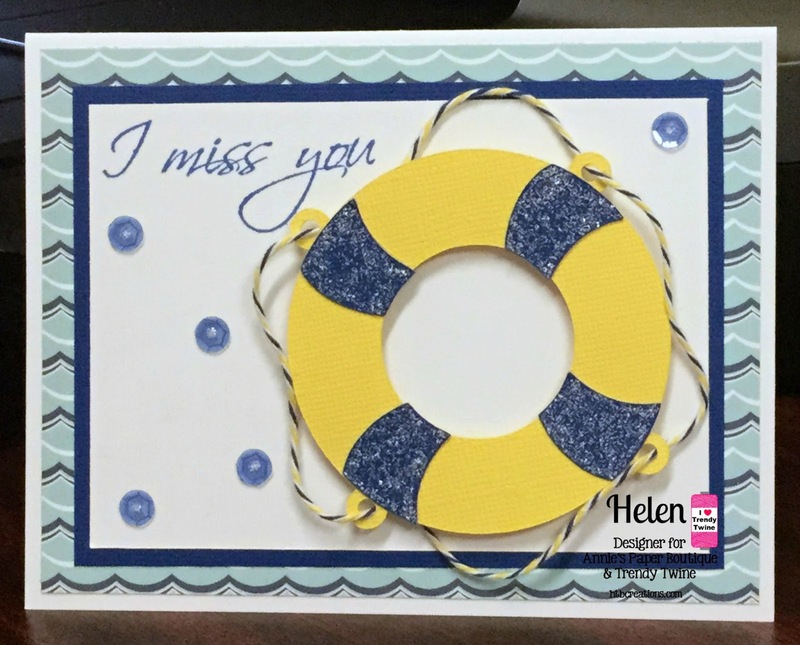 I have a quick card for you today featuring the fabulous Nautical Trendy Twine. I cut out this fun life preserver from my Cricut. The Nautical Trendy Twine was perfect for the 'rope' around the outside. I taped a bit to the back and glued right on the edge to make the twine stick the way I wanted. The waves paper was perfect for this card. Then I added some sequins to finish it off. Be sure to visit Annie's Paper Boutique for all your twine and packaging needs! Super adorable card Helen! Love how you added the twine! I love how you used the twine. Looks amazing and perfect! That preserver was the perfect choice! Awesome card my friend!!! Fun way to use the twine!! Such a delightful card and the PERFECT way to use that twine!!! Such a great card, love the fun design and the life preserver! The way you used the twine looks awesome! Cute card!! Love how you added the twine and the sequins too! Fantastic! the life preserver is fabulous and the twine is so perfect!